Isabella Dawis as Edith. Photo by Michal Daniel. 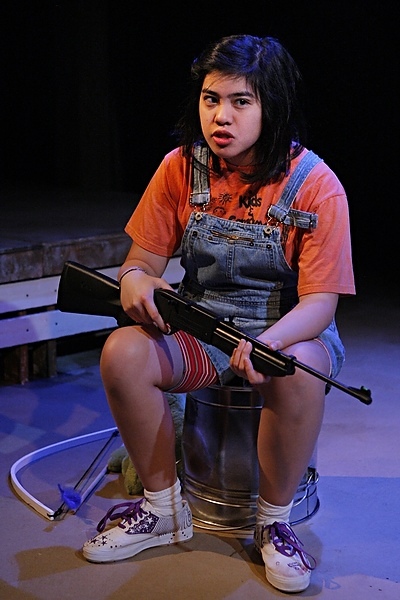 It has been an amazing adventure, but this day had to arrive: the final opening night in the Rolling World Premiere of Edith Can Shoot Things and Hit Them is being presented by Mu Performing Arts at Mixed Blood in Minneapolis, Minnesota. This plucky bunch of kids (by which I mean the actors, not the characters, natch) have been working their bums off, and after an awesome preview last night I know you’re going to love what you see if you join us tonight. City Pages has given us this lovely bit of advanced press. And, if you’re still not convinced, tune in to All Things Considered on NPR from 4 – 7 EST (3 – 6 CST) to hear a piece by Elizabeth Blair on Edith at the Humana Festival and across America, which will include interviews of May Adrales and me, plus scenes performed by the Humana cast (Teresa Avia Lim, Jon Norman Schneider, and Cory Michael Smith). You can stream the show live online here. 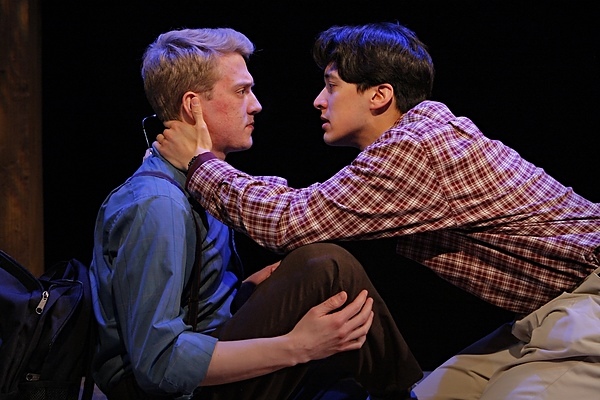 Matthew Cerar as Benji and Alex Galick as Kenny. Photo by Michal Daniel. • Lavender Magazine’s “Night at the Theater”– March 22 at 7:30 pm. Complimentary hors d’oeuvres, and non-alcoholic drinks will be provided beginning at 6:30 pm in the Mixed Blood Theatre lobby. • Post-show discussions will be held after the 2:00 pm performances on Sunday afternoons March 18 and 25. 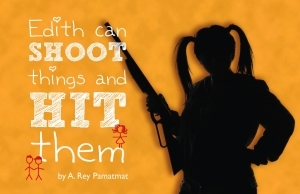 At last the day has arrived: the first preview of the final Rolling World Premiere production of Edith Can Shoot Things and Hit Them at Mu Performing Arts! Although my home state is Michigan, the Minnesota Rolling World Premiere production of the play at Mu Performing Arts can’t help but feel like a homecoming of sorts since it will be the first production of Edith Can Shoot Things and Hit Them in the Midwest! I am super excited to see how the show plays for an audience familiar with the upbringing and values that shaped my own childhood. I will be in town from Wednesday through Sunday this week, and I’ll be checking out each preview and, of course, the opening night. Come see the amazing work Mu has put together! To whet your whistle, here are three meet the cast promos that they folks there have put together. Come join the fun, and I’ll see you very soon Midwesterners! I’m a little late with this news, but it’s been a bit of a busy month! 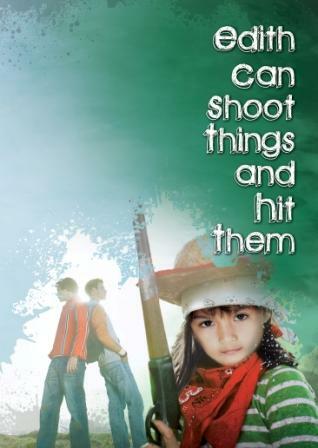 The American Theatre Critics Association (ATCA) has named Edith Can Shoot Things and Hit Them as a finalist for the Steinberg/ATCA New Play Award. To say that I’m honored would be a serious understatement. Let’s go right to flabbergasted. I’m flabbergasted. 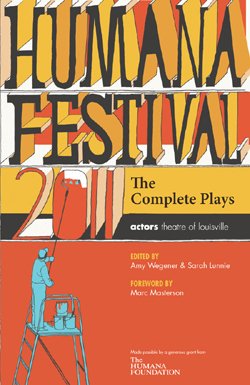 The Award and two Citations (for the runners up) will be presented at the 2012 Humana Festival of New American Plays on March 31. I’ll be returning to Louisville for the first time in a year, this time as an award finalist, a spectator, and a representative of The Lark. Perhaps I’ll see you there! In other news, Mu Performing Arts is a week away from previews and opening of their production of Edith, the final stop of the play’s Rolling World Premiere. It’s been an amazing year, and I can’t wait to see it capped off in the first Midwestern production of the play! I’ll be in Minneapolis from March 14 – 18, so please come out and see the show. 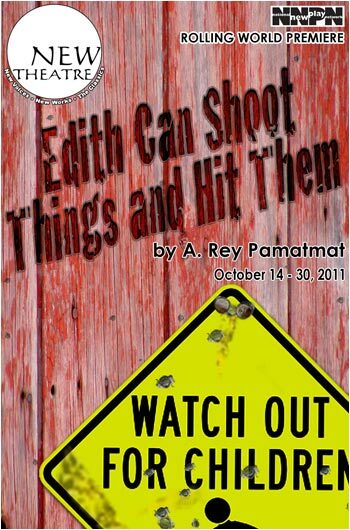 Edith opens tonight in Coral Gables, FL! To get you as psyched up as I am, here are some advance articles and listings from the local news outlets.